A two-day clean-up effort has recovered 3,323 dead pig bodies from the Huangpu River, which cuts through the middle of Shanghai. Local media are reporting that the pigs came from Jiaxing, in Zhejiang province, where over 20,000 pigs have been found dead in villages since the beginning of the year because of swine flu [zh]. While the public is very anxious about the potential pollution caused by the decaying pig carcasses, local authorities quickly asserted that the dead pigs had not polluted the water supply. Shanghai's water comes from Yangtze River and authorities claim the pigs died of cold weather, not a virus. However, most netizens are skeptical of these claims. The Zhejiang Agriculture Department said that the dead pigs floating in the Huangpu River died of cold weather rather than swine flu. 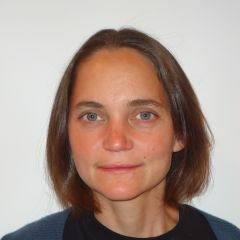 The experts also said that the water quality has not been affected. Does that mean that the pigs are safe to eat? Why don't we serve the leaders some of the Huangpu river pigs’ meat? 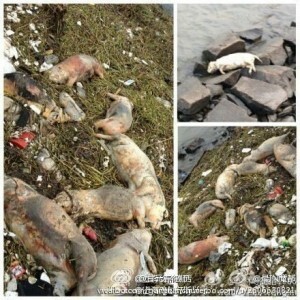 A collection of photos of dead pigs near the Huangpu River. 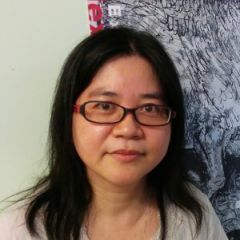 Image from Lawyer Gan Yuanchun. Public Domain. [Responsibility concerning the dead pigs incident] According to Jiaxing Daily, the dead pigs in Huangpu River came from a virus in Jiaxing. In January, 10,078 pigs were found dead in a village. In February 8,325 more were dead. In the past few days, on average 300 pigs were dead everyday. The village has kept digging holes to bury the pigs. So far around 1,200 were found in the river. Had other dead pigs been served at people's dinner tables? Why doesn't the government alert people about this news? Many people have raised questions concerning the dead pig incident in Huangpu River. How did the 3,000 pigs make it to Shanghai? Usually, they would have ended up in people's stomachs. The reason is that not long ago, people who had sold pork from dead pigs were tried and convicted. Last November, a court case in Jiaxing tried 17 people who had sold 77,000 dead pigs for 8.65 million RMB (1.4 million USD). The main perpetrators, Dong, Chen and Yao have received life imprisonment. Such big news and there isn't any government authority to take responsibility and comment on the incident. Now we have the Two Congress, but no representatives to be accountable. What has happened to our society? Is there anything left apart from power struggle? More than 2,000 dead pigs entering Huangpu River is not news. More than 20 million Shanghai people drinking dead pig soup for half a month is not news. That the Shanghai Water Supply Bureau claimed that Huangpu River's water quality is up to the national drinking water standard is news. [Sad news: Pigs have beaten the Chinese media] We have information distribution tools like micro-blogs, mobile chat, web portals, SMS, websites, television, and newspapers. Yet the swine flu that killed thousands of pigs in Jiaxing has to rely on the dead pigs for spreading the news — not until the dead pigs floated into Shanghai did the public learn the news. In the new media era, we still depend on pigs to obtain information, isn't that sad? The incident has caught the public attention. I urge the authorities to reveal the truth and the water supply factory should look into the bio-toxicity data. Don't cover up the truth because of the Lianghui. Don't risk your credibility. If anything goes wrong, the consequences would be too heavy to bear.